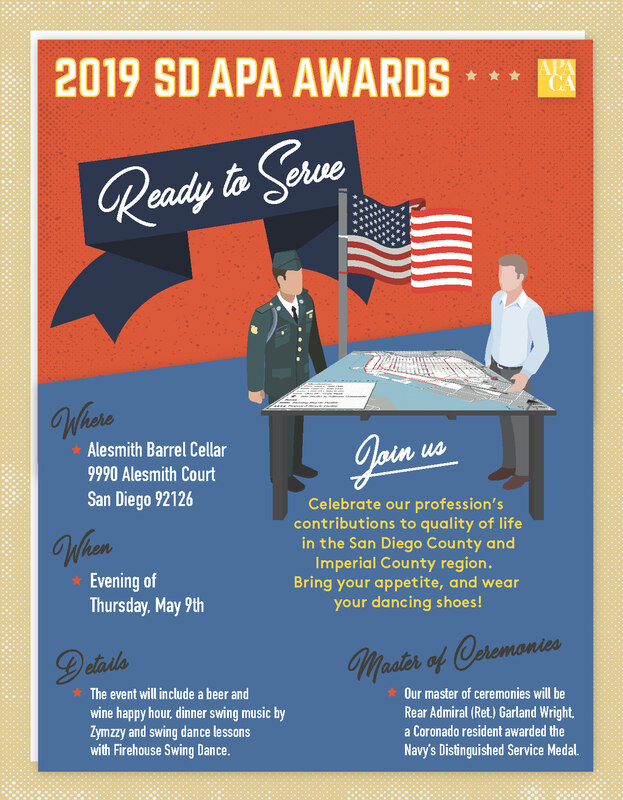 The SDAPA Awards will be held Thursday, May 9th at the Alesmith Barrel Cellar at 9990 Alesmith Court. Situated in the centrally-located Miramar light industrial area, the Barrel Cellar will give attendees a view of the inner workings of one of San Diego’s most successful breweries. Acknowledging the important relationship between the region’s military and urban planning communities, this year’s awards event theme is “Ready to Serve.” Our master of ceremonies will be Rear Admiral (Ret.) Garland Wright, a Coronado resident awarded the Navy’s Distinguished Service Medal. The event will include a beer and wine happy hour, dinner, swing music by Zymzzy and swing dance lessons with Firehouse Swing Dance. Join us to celebrate our profession’s contributions to quality of life in the San Diego County/Imperial County region. Bring your appetite and wear your dancing shoes!